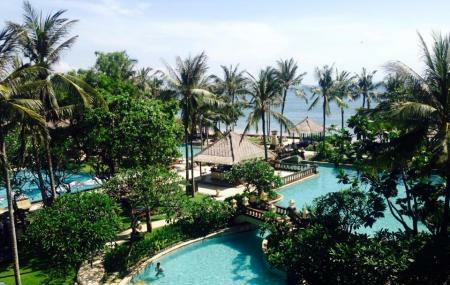 Nusa Dua is a peninsula in South Bali comprising of high-end hotels, all-ranged accommodations, restaurants, cafes and attractions that are perfect for a touristy visit. But the most fascinating bit of Nusa Dua is its beaches. The Pantai Geger or the Geger beach is the public beach perfect for sunbath or a swim. You can also stay at this beach and pamper yourself form some traditional Balinese massages. Other beaches around Nusa Dua include: Pandawa beach, Blue point beach. Places worth visiting hen in Nusa Dua include: Water blow, Pasifika museum, Serangan Island. Restaurants and accommodations are available. Different attractions on and around the Nusa Dua beach have separate timings. How popular is Nusa Dua? People normally club together Garuda Wisnu Kencana Cultural Park and Kuta Square while planning their visit to Nusa Dua. People also prefer to end their day with Nusa Dua.